Author and Fitness/personal coach J.J. Flizanes’ latest book was release a few weeks ago, and I have been meaning to blog about it. 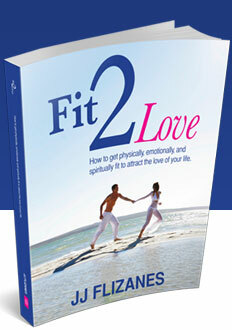 We had a loose interview over the phone and she combined that, with content for her new book, Fit 2 Love. The book is written for women, ready to do explore what has been holding them back from finding that special someone. I am all for that. Get the book here as well as a few goodies. w00t! Nice, Casey. I love that you’re being featured in a book about love! I want to see more writing about this from no. My name is Audre and I just finished reading this “Fit 2 Love”. I wanted to thank you for being a part of the book and for sharing yourself. First off, it’s nice to know that there are grounded, spiritual men like you out there! Thank you!!! I am a beautiful, overweight, single woman who is both a friend and a client of JJ’s. I’ve currently read her book and am blogging about my weight release, dating, self-love exploration. Like you, I’m on a path of growth and deeper awareness about who I am, what I want, what I don’t want and I will Play (thank you for that reminder) along the way! Thank you for your input about dating. I was touched by everything you said and especially moved by the reminder to be in touch with my femine side. I have a strong masculine side that I have spent more time honing than the feminine side. The way you speak about the feminine is beautiful reminding us to not forget our essence and that embracing our feminine allows for the man to “call forth” his masculine which is exactly what I’m looking for. Thank you again for your sharing, vulnerability and contribution. Lots of love to you in your future endeavors and in that wonderful relationship that you now have in your life! I’m looking forward to the same loving experience! oh, great to hear this Audre 🙂 I am glad my experience had an impact on you and I thank you for sharing this impact with me. I love the polarity that the masculine/feminine dynamic can provide. YES! let your feminine shine!